Vasyl Lomachenko and Jorge Linares give us something special! Lightweights Vasyl Lomachenko and Jorge Linares last night gave us all that is great about this great sport. Battling it out with everything on the line in New York, Lomachenko and Linares dazzled us, and each other, with skill, speed, cerebral brilliance and toughness. Lomachenko, at just 11-1(9) became a three-weight ruler with his tenth-round KO win and the praise continues for the gifted southpaw from Ukraine. But Linares deserves credit too – and a lot of it. 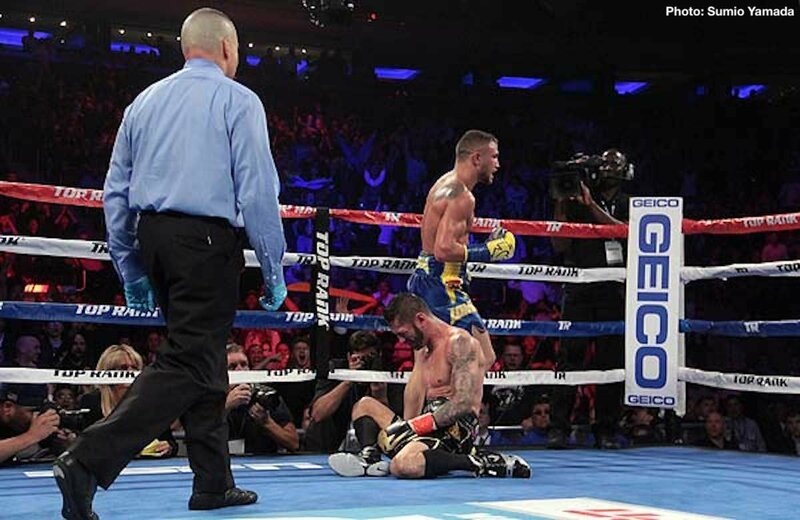 For the first six rounds it was either man’s fight; and then, for the first time since 2007 and in only the second time in 415 fights amateur and pro combined, Lomachenko found himself on the floor. Linares, taking advantage of a somewhat overconfident Lomachenko, drilled his challenger with a perfect straight right hand to the chin in round-six. Oscar De la Hoya at ringside was not the only person to leap into the air! The fight, already an excellent one, was now a classic – for certain this year’s best so far. Linares, never once looking like quitting in the manner Lomachenko’s previous four opponents had done, dug deep, used his own fast hands and combinations and, cut above the eye, managed to take what came at him from all angles. Lomachenko had what was easily the toughest fight of his entire pro career last night and the sheer size and reach of the defending 135 pound king proved a big factor. But Lomachenko danced his usual dance for the most part, even though he had to work that much harder, with a more thoughtful look on his face. It was close and watching live one was never exactly sure who would win. Until round-ten. If Linares threw a perfect punch in dropping Lomachenko in the sixth, then “Hi-Tech” landed a perfect, perfect punch in putting Linares down for keeps in the tenth. Tagging Linares, 44-4(27) with a fusillade of shots to the head, Lomachenko then snuck in a wicked left hand to the body, to the liver, that hurt Linares bad. It was over and fans everywhere got their collective breath back. An intense fight, a great fight, a special fight. Both men covered themselves in glory and we fans say thanks so much! You are here: Home / Boxing News / Vasyl Lomachenko and Jorge Linares give us something special!